Fever is the commonest symptom that one would come across. From a minor self-limiting flu to a fatal cancer, the fever could be a representation of anything. And for that reason alone, even if easily taken care with an over-the-counter drug, fever still sets fear in the people’s heart. How do we define fever? 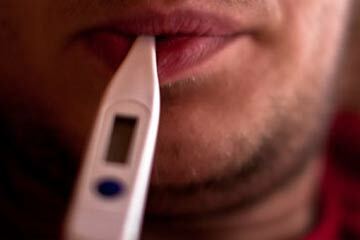 Fever can be defined as a temporary rise in the body temperature, usually a result of underlying illness. Commonly fever is the earliest manifestation of something abnormal going on with the body. Although an adult is able to tolerate fever well up to 102-103°F, in children even slight rise in temperature mandates medical attention. Hence, it’s appropriate for everyone to know the basics of fever including when to visit the doctor or emergency hospital. Diurnal variations: The body temperature changes throughout the day, mostly maximum during the evening. Hormonal variation in women: In women the hormonal changes that occur throughout a menstrual cycle can bring significant change the body temperature. The temperature can rise by one degree during the second half of the cycle. Usually around the time of ovulation (commonly 14th day) the temperature is maximum. Temperature can also rise under many other circumstances like during emotional outburst, rigorous activities, on medications, in hot and humid environment, on wearing hefty clothing, and while eating. Fever is not our enemy. In fact it is our body’s soldier against infections and other conditions. Most pathogens require same temperature as our normal temperature. Hence, during infections, as part of defense system, body temperature is raised to make conditions unfavorable for the microbes. If someone has fever then it means than the body is fighting against an infection or another condition and underlying problem must be treated. In some cases the fever continues for days to week and will remain undiagnosed even after intense diagnostic methods. Such a fever is labeled as pyrexia of unknown origin (PUO). High temperatures may lead to brain damage especially in children. However, it occurs usually requires temperature as high as 107°F. Good thing is even if untreated temperature wouldn’t go that high as long as the child isn’t overdressed in warm clothes or surrounding is too hot. Higher temperature increases the risk of afebrile seizures. Nevertheless an episode of afebrile seizures doesn’t mean that the child has or will develop epilepsy.